On Tuesday night, I decided to take a trip over to SushiSamba on Wells Street in Chicago to try out the delicious and extremely well priced Rioja Restaurant Week menu. For $35 per person + tax + service, you get 2 courses and 2 wine pairings (see bottom for quantities). The first wine is the Hacienda Lopez de Haro Crianza 2005 paired with a plate of appetizer tastings. 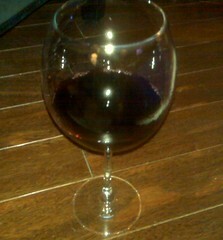 I started with the wine and it did not taste right, I took a second sip and it just did not taste right to me. Finally, not knowing exactly what the wine should taste like, I asked Chef Dan to describe the wine to me so I could take notes. I think my exact words were, "I am not too sure this wine is right for me, can you describe it to me?" Dan took ONE sip and realized that the wine had turned. He spit the wine back into the glass and ordered the bartender to TOSS the bottle and open a new bottle. The moment I took a sip from the second bottle, I realized the difference. I am SO GLAD I said something, otherwise, I would simply think the wine tasted badly - which was not the case. The glass of GOOD Hacienda was mild bodied, slightly spicy and went quite well with the appetizers. 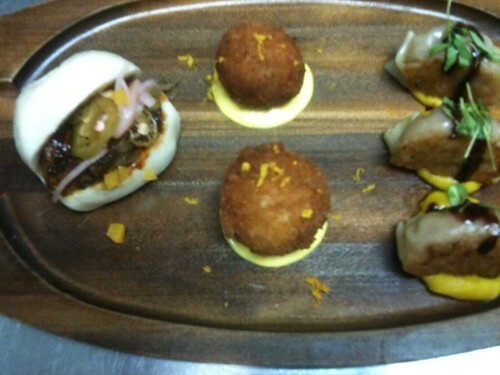 The appetizers consisted of 1 Short Rib Bao, 2 Duck Croquettes and 3 Kobe Beef Gyozas. The Short Rib Bao was great because the bread was only slightly sweet with pickled jalapeno & pickled onions. Delicious. The Duck Croquettes were really hearty, lightly breaded with lots of duck meat. Served on an orange serano chili sauce. The Gyoza (potstickers para tu Americanos) was filled with Kobe Beef, collard greens, shitake mushrooms and a garlic sesame sauce. They were served on a Kaboocha puree. Kaboocha is Japanese pumpkin, I had to ask. The wine for the second course Zinio Reserva, 2001. According to the menu, it should be 2005 but Chef Dan informed me that 2001 & 2005 were both exceptional years for Rioja. This wine was more bold than the first, it was bigger and it worked well with the Malbec butter sauce of the skirt steak. The Short Rib, Korean style (similar to Kalbi), thinly sliced pieces of rib meat with a bit of a smokey flavor - an Asian BBQ sauce. Chef Dan explained to me that "Short Ribs" are from the side of the cow where the ribs do not connect, something I had not previously known. 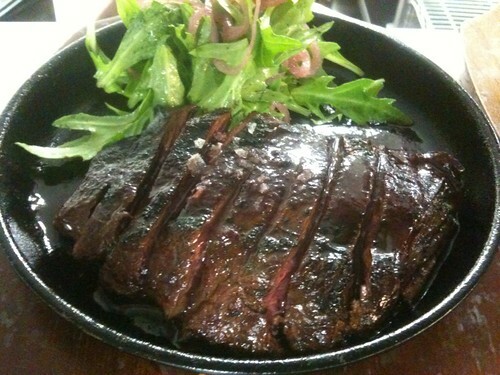 The Skirt Steak was prepared to perfection. Served with a Malbec butter sauce, it was delicious and truly worked well with the larger flavors of the wine. The steak is served with Miunza (similar to arugla) and picked shallots. If you were to ask me, I preferred the skirt steak. Though I liked both dishes, in my opinion, not only did the skirt steak work better with the wine pairing but it also seemed like a bigger bang for the buck! Disclaimer: SushiSamba rio is a client. That's a great idea for an upscale restaurant -- more of an event... like going to a party. No decisions to make, you just enjoy the evening.